Of all the places that I ate in Morocco, I wanted to share with this blog my favourite: Dar Nejjarine. You won’t find Dar Nejjarine without help. To be honest, if I hadn’t been with two very bolshy New Zealand lads I doubt I would have followed the spruker from the main area through all the back alleys and side streets but, believe me, it’s worth it.After some negotiation, we were shown to a beautiful roof terrace covered with open tents that was like something out of an Arabian nights fantasy. It was fantastic to be away from the noise of the main thoroughfare and up on rooftops. There was also some music and a belly dancer during the meal as well. It was exactly what you want from Marrakech. 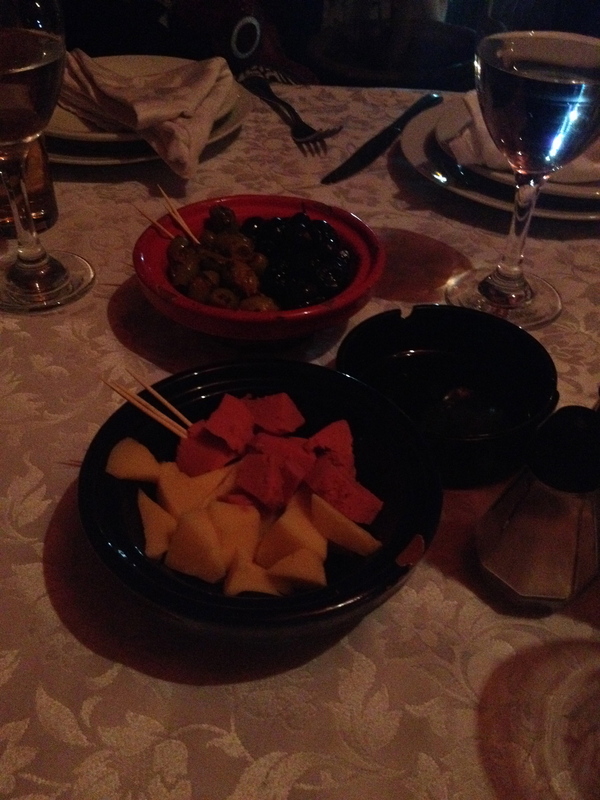 As soon as we sat down we were served what I can only assume was the Morrocan version of cabanossi and cheese. It was a nice little nibble with our wine and beers (which arrived incredibly quickly) while we waited for the starters. 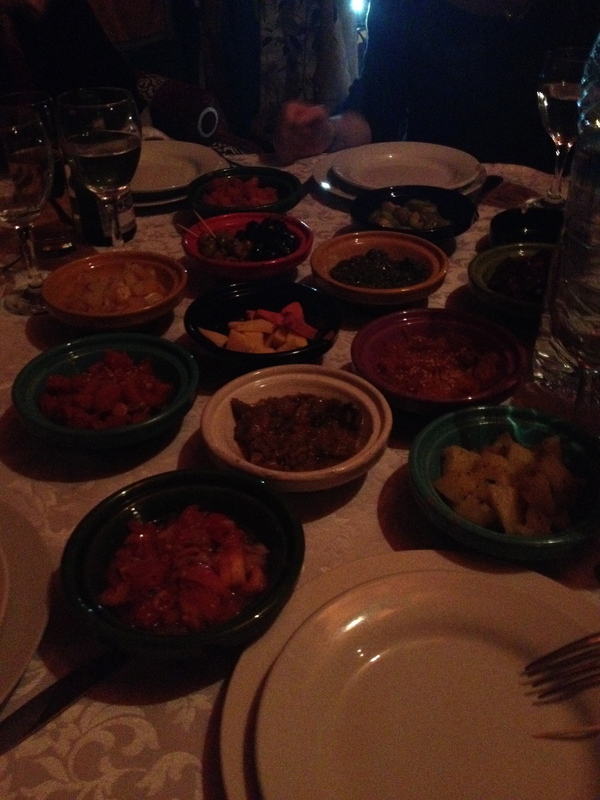 The starter was a mix of ten Moroccan salads with bread. I’d already fallen in love with Moroccan bread which was a cross between a normal leaven bread and a heavier soda bread (or something of that ilk). If you want to get a taste of Moroccan cuisine, then trying all the starter salads is the way to go. I won’t mention all ten salads here but the definite highlights for me were the aubergine which was prepared like a caponata with a bit of tomato, oil, spices and vinegar. The other one that I loved was the pumpkin (or it might have been sweet potato). 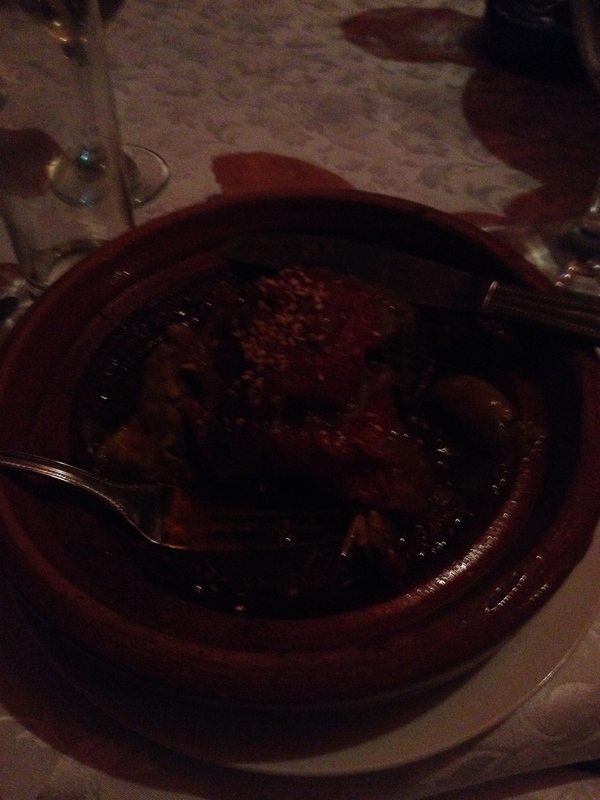 It was wonderful and smooth with sultanas through it and showed how well the Moroccans can do sweet food. After the salads, I was fairly full but I opted for a slow cooked beef with tomatoes and grapes. This might sound like a strange combination but it worked incredibly well. The beef was soft and melt in the mouth. The sauce was sweet and sour at the same time making it a beautiful, rich meal. We did have dessert with the set menu that we ordered called Pastilla au lait. It was layers of pastry with cream and nuts. Like everything in Morocco, I expected this to be quite sweet however, the pastry had been burnt and had a very bitter after taste. There wasn’t enough of the cream and nuts to combat that and in the end I left most of the pastilla. To be honest, don’t let that deter you. By the time we got to the dessert, we were so stuffed we didn’t really need it. The other important thing to mention about Dar Nejjarine is that is serves alcohol and this is something that is a little difficult to find in Marrakech despite the number of tourists. It was also very reasonably priced. If you do find yourself in Marrakech and want to try something off the beaten track, I would definitely recommend Dar Nejjarine.